I don't know what else to say about this situation. Poor Sweet B (who is too young to have had the chicken pox vaccine) went to bed on Saturday night with what looked to be 2 little pimples on the side of her forehead. I saw them, John saw them - we shrugged them off. I thought that maybe they were little pimples from her head being so sweaty in her adorable piggy Halloween costume. NOPE! She woke up on Sunday morning with a rash that clearly resembled chicken pox. So after a brief conversation with the on call nurse, I rush her to the doctor for a nice emergency Sunday visit. And I am not that mom. We have 2 children and have gone to the doctor on a weekend approximately one time. I barely call the office with medical questions. But this rash freaked me out because it was on her face. 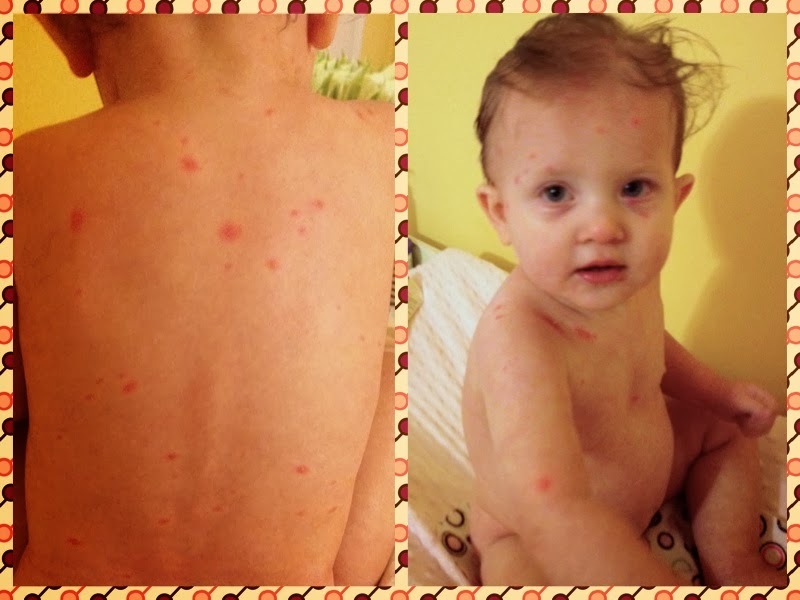 Diagnosis: Most likely chicken pox. There is no way to know 100% for sure (there is not a "test" like they have for things like strep throat) but that was what it was looking like. And trust me if there were ever any doubts there aren't any after what she looked like this morning! Treatment: Nothing...ride it out...give Tylenol if she gets a fever...wait it out - Great doc! My favorite type of treatment (rolls eyes). You would think that in the year 2013 we would be able to make this go away. Poor B. I itch just looking at her. How did Blakely get this? I am so germ-phobic (John is even worse)! We actually wash our kids hands for them! And make them sing the ABCs *slowly* while we do it. We use hand sanitizer every time we leave a store - not just sometimes - every.single.time! We use shopping cart covers for crying out loud! So how did Sweet B get this? The doctor says "It's airborne not contact...she could have gotten it anywhere. It's spread through respiratory droplets (think coughing and sneezing). Then, those little droplets travel through the air. That's why it's so contagious. It's airborne. There's a seven day incubation period...where was she seven days ago?" Sesame Place. That's where we were exactly seven days ago. Ugh. And my girls love Sesame Place, and I love taking them just to see how much they love it...but this is why I typically avoid places like that! Please Touch Museums? No Thank You!!! I call them "Please get sick museums." We don't do petting zoos or McDonald's play places (or McDonald's period for that matter). Did I mention how germ-phobic I am?!?! Sigh. I feel so bad for Blakely. But she doesn't seem to care! She hasn't even itched those things once. At mealtimes, she is as ravenous as ever. She's her usually sweet and spirited self...trying to climb over all the baby gates and get into as much trouble as possible. But she's not acting one bit sick! Day # 4 - I'm grateful it's not the stomach bug! Seriously people! There is nothing worse than the stomach bug!